Owner: Have you ever worked in a bar? Owner: Have you ever in customer service? Me: No, I was a babysitter? Owner: Ok come in at 8. I left thinking what the hell Paige you didn’t even try to convince him. When I arrived at 8, on the dot, I was told I could stay for an hour since it was ‘covered’. Nearly 7 hours later at 2 am I was back in my own bed. I must have been a bit shell-shocked. I spent nearly the entire night trying to keep up with the mountain of shot glasses in the sink while the sound of breaking glass and bro chanting surrounded me. At one point I remember solo booty shaking in the comfort of the kitchen to Rihanna. O and Rihanna, if you ever read this thank you for the comforting sound of Pon de Replay. That night I remember lying in bed thinking this must have been one of the oddest days in my life. Now, after 2 and a half months of employment at the bar, my time has come to an end. One night at the bar I thought I think I would rather be drinking here than working here. Given that I only had a month and a half left I needed the physical and emotional time to say goodbye, to prepare. But I learned a lot about myself from my time at the bar. I learned to have more confidence in my ability to approach others in another language. My biggest barrier to learning Spanish has by far been my fear of butchering the language. My confidence held me back for a long time. In this job I has no choice but to sit in that uncomfortable space of not understanding and trying anyways. My ability to think ‘whatever if I sound stupid’ and then trying anyways was my biggest take away. I will forever be grateful for the opportunity to come face to face, over and over again, with the discomfort of approaching others in a new language. I learned to say no. Often time I would have drunken men approach me asking me personal information or asking me for ‘a coffee date’. When I first arrived to the bar I would talk around these advances. But by the end I felt the power to say no I don’t want to go out with you. Often as women we are taught to appease these advances. To be polite and charming—being direct is often seen as bitchy. I realized that my ability to say no made me feel more secure in myself. Through trial and error I was reminded that my ability to say no is not only powerful but also essential for my own mental and emotional security. I felt more in control behind the bar instead of feeling like a sitting duck. I was reminded of the importance of supportive co-workers. I worked with the most wonderful French woman. The way she interacted with the room allured me. She not only controlled the situation but also effortlessly floated around the bar. All while teaching me patiently how to work in a bar. The fun my co-workers brought into my life reminded me to breath and disfrutar. I learned that I could be pretty charming when I want to be. I was reintroduced to my flirty and fun side. Navigating a new country and language often left me with a mix of emotions- excited but overwhelmed, carefree yet caution. I was reminded of the importance of ‘feeling myself’ from time to time. How feelings of letting loose a bit could be good for my daily life. I lied before this was the most important lesson I learned. Remembering and following the goals I set out for myself. 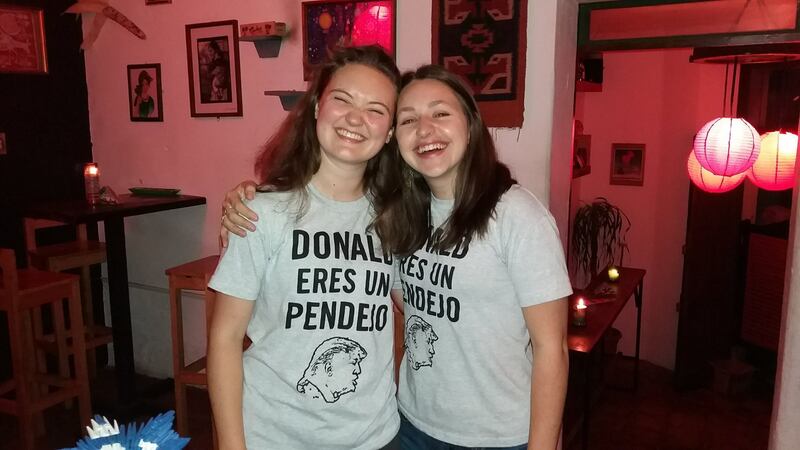 My time at the bar ultimately came to an end because I reevaluated my goals—to learn Spanish and to spend more time with my community. As a people pleaser in recover I was hesitant to tell the owner that my time had to come to an end. Following my gut reaction to finish at the bar was the best decision. I was reminded that I know my needs and myself—I just need to continue to follow that voice. I will also say that the majority of my time wasn’t actually spent in the Irish Pub but was in the mescal bar co-owned and attached to the pub. But it’s a bit more fun saying that I once worked at an Irish pub in Guatemala.